Update – new mobiles from The Modern Baby Co.
A sweet little mobile is the perfect accompaniment to a beautiful nursery and here are some new releases to enchant a new generation of babies. 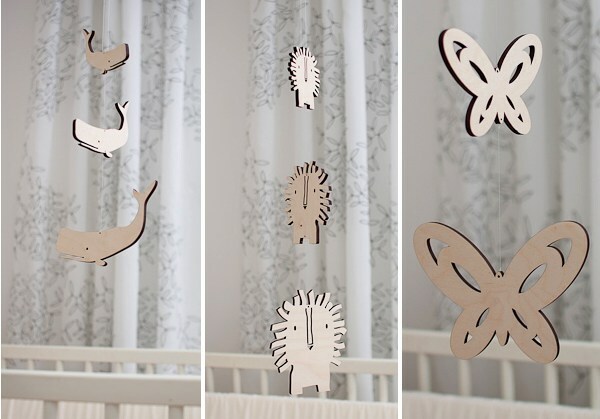 The Modern Baby Co. has branched out into beautiful wooden mobiles, turning out three new styles – whale, lion and butterfly. These peaceful pals will provide gentle entertainment for those who are new to the world and we’re sure you’ll agree they’ll make a nice feature in your home after baby has grown. Have a look at The Modern Baby Co. onesies and art we have featured previously and you may want to add to your mobile order. Mobiles are US$40 each from The Modern Baby Co.